What is the el espectaculo de la cocina project? The kitchen show project was were students had to choose a spanish dish that was 10 steps or more. We then wrote the directions and ingredients in spanish by using a new type of congregation which is commands. We had to use commands because in a recipe you are telling someone what to do, in order to have correct spanish we had to learn how to write commands. After we translated our recipe we created a video of us making the dish step by step and narrating it in spanish as if you were on a cooking show. I feel like I did pretty well on the kitchen show project, I put a lot of time into my video and made a good dish. However what I struggled in was writing the recipe in Spanish, since a lot of the Spanish that I have never learned it was hard for me to write the proper spanish/ congregation for each word. Next time if I have trouble I will advocate to my teacher and ask questions. El proyecto de " Mi Frida"
What is the Mi Frida project? 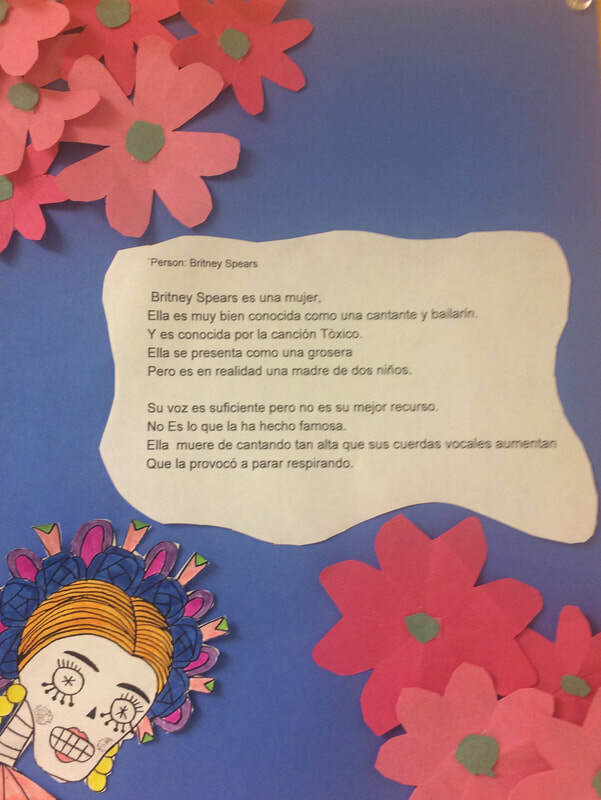 To kick start our spanish project we spent several week studying Frida Kahlo through this project we also worked on writing past tense in spanish. Most of the studying consisted of watching the Frida Kahlo movie, writing and learning about her, and studying her famous paintings. After we packed our brains with all the information about Frida Kahlo, we started creating our own project. We first chose a person that we would like to write/paint, they could be a famous person, family, friends, and etc. The person I chose was my grandpa, my grandpa during that time died a few weeks before we started the project. By choosing to paint him and write about him meant a lot to me and my family. Next we started to create a rough draft of our biography and started to refine it more and more so it would be perfect and make sure all of our spanish was correct. I am very proud how my biography turned out, I did have corrections but it helped me grow and learn how to write proper spanish. Finally from what we learned from Frida Kahlo we chose a painting that spoke to us the most. We made it our own by putting the person we wrote about and putting them in the painting instead of Frida Kahlo. I am beyond proud on how my art turned out I definitely put my soul into it and it turned out so good, this was by far the best art piece I have ever done. What is a Calaveras Literaria? When seeing the end product of my Calavera I was happy by how it looks. I feel that during this project I stayed focused and put 100% effort into it. However I wish I could've used some of my own knowledge on what vocabulary I knew instead of relying on Susy and translators to help me right the poem. From this experience I now will improve on my Spanish and use what I know from the past year I have learned Spanish and not rely on translators.